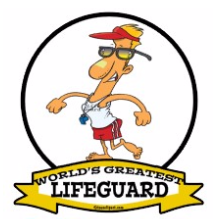 Interested in a great summer job or challenging career as a professional lifeguard? Through videos, group discussion and hands-on practice, you’ll learn teamwork, rescue and surveillance skills, First Aid and CPR/AED and other skills you need to work as a professional lifeguard. If you are interested in becoming a lifeguard, please fill out the bottom portion and return to Ms. Treat with your Payment of $150 (checks made out to Judi Treat). Don’t miss out on the opportunity as classes will close at 10 participants. If you have question, please ask Ms. Treat, you must be able to attend all sessions. Complete all eLearning units prior to class. Pass final written exams with minimum grade of 80 percent.